The product consists of 32pcs colorful LED lights. It can flash 32 different kinds of patterns, each pattern will be changed every 4 seconds. Pattern is clear and complete when speed up to 20 miles/hour. In automatic mode the lights only turn on when it is dark out and your wheels are turning; in manual mode, the lights stay on full time. Feel free to use on rainy days, the light is fully waterproof. ATTRACTIVE PATTERNS: spoke light consists of 32pcs colorful LED lights. It can flash 32 different kinds of patterns, each pattern will be changed every 4 seconds. Pattern is clear and complete when speed up to 12.4 miles/h. Get What Modeal You Like: In automatic mode, it is only working at night and motion; in bright mode, it is working at any time except "Turn Off"(longer pressing button about 2 seconds to turn on/off the lights). 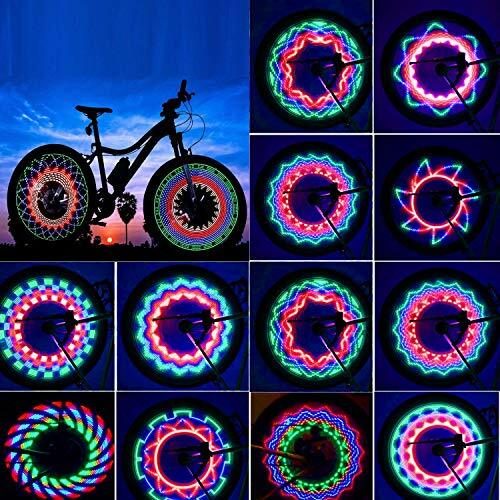 WATERPROOF: Bike wheel lights led waterproof designed. Don't need to worry about the bike tire lights will be damaged when riding in rainy days, but it can not be soaked in water. Super Bright to Keep riding safe: Our bicycle wheel very lightweight (net weight 0.17lb , 2.77ounce) and super bright which is eye-catching from all angles to enhance maximum visibility on the road for your cycling safety. Power by: 3 X AAA Battery (NOT INCLUDED),it could be maximed to 10 hours when it works. 100% Satisfaction Guaranteed - If you don't satisfied with our product you will receive a full refund . If you have any questions about this product by TGJOR, contact us by completing and submitting the form below. If you are looking for a specif part number, please include it with your message.